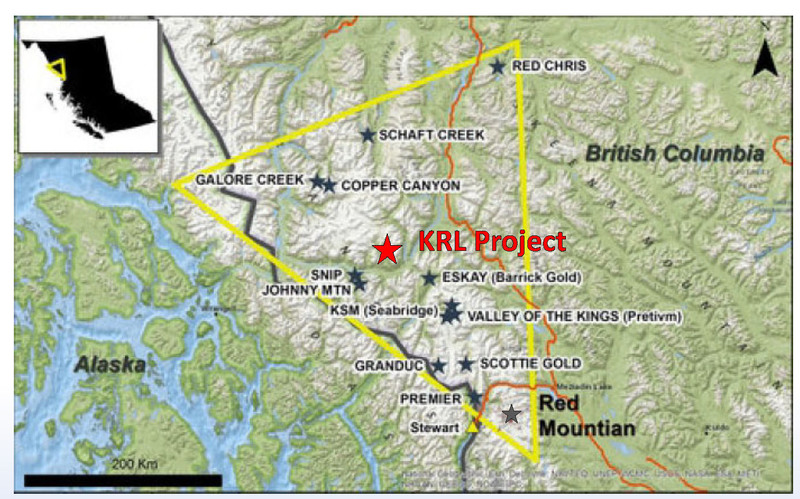 The KRL Property is host to a swarm of high-grade gold bearing quartz veins exposed in the alpine slopes east of McLymont Creek near its junction with the Iskut River in the Golden Triangle area of northwest British Columbia. Trenching in the late 1980s exposed numerous 10-100 cm-wide quartz veins that assayed in excess of 8.5 g/t gold with multiple samples returning values in excess of 200 g/t gold. At least 11 veins were identified with potential for additional veining below the treeline and under vegetation and talus cover. 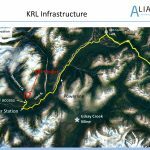 The property lies within 2 km of road access and within 5 km of power from AltaGas’ McLymont Creek and Forrest Kerr power projects, and is adjacent to Aben Resources’ Forrest Kerr Project. The Golden Triangle is host to past and present producers such as the Eskay Creek, Snip, Premier, Brucejack and Red Chris mines and major projects including Galore Creek, Schaft Creek and KSM. 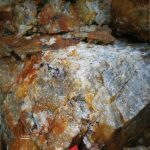 Recent discoveries by Aben Resources, GT Gold and Golden Ridge Resources highlight the potential of the Golden Triangle for new discoveries. 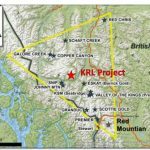 The KRL Property is situated in the heart of the Golden Triangle of northwest British Columbia. The property lies on the west east of McLymont Creek, approximately 5 km from the McLymont Creek power station operated by AltaGas. A road servicing the intake for the power plant terminates approximately 2 km from the property. The past-producing Eskay Creek Mine, one of Canada’s highest-grade gold producers, lies 23 km to the southeast and the new Brucejack Mine operated by Pretium lies 48 km to the southeast. The 1989 fieldwork conducted on behalf of a previous operator consisted of geological mapping, soil sampling, ground magnetometer, electro-magnetometer, mapping, hand trenching, and rock chip sampling. 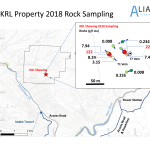 Prospecting and sampling encountered a quartz vein swarm along the west boundary of the property directly adjacent to a competitor company’s ground. 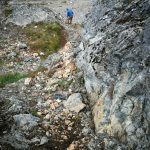 The quartz veins ranged up to 1.0 metre in width, dip steeply to the north and strike northwesterly, with the largest vein exposed for a distance of sixty metres along strike. 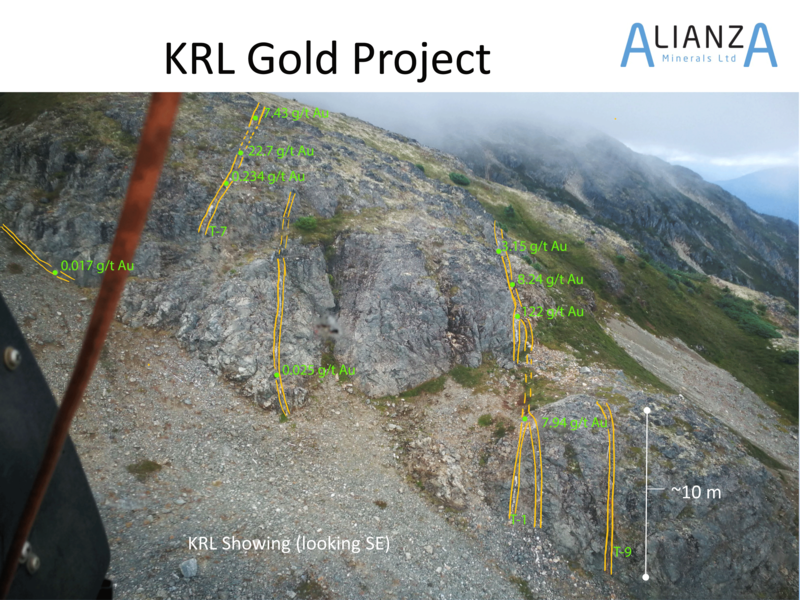 Mineralization includes pyrite, chalcopyrite and visible gold with narrow channel samples returning up to 248.1 g/t Au. Soil sampling encountered several scattered anomalies with values of up to 225 ppb Au. Magnetometer and VLF-EM surveying delineated a number of localized magnetic anomalies and a large number of VLF-EM anomalies. On the adjacent competitor’s ground, a 1990 field program included soil sampling and further prospecting. Soil sample values of up to 1,445 ppb Au and rock sample values of up to 0.979 oz/t Au (33.6 g/t) were encountered, but the veins were thought to lack the size and continuity necessary for an economic deposit and likely due to the nature of the claim position, no further work was recommended. The combined work of the previous operators show a vein swarm with minimum dimensions of 400m x 600m and which appears to be open to the west, north and south. It is thought that the compromised land position (the gold showings straddling the property boundary) may have been detrimental to the development of the project. 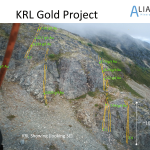 The present KRL property encompasses the entire showing and surrounding area allowing for a coherent assessment of the high grade gold veins and the potential for additional, and perhaps economic, gold concentrations under talus or vegetation cover below the treeline. Alianza is planning to complete a prospecting, mapping and sampling program to identify potential new veins both in the alpine and areas of the property below treeline. Previous workers have shown that soil geochemical surveys may be helpful in identifying covered mineralization and coupled with structural mapping of the veins and controlling structures and a re-interpretation of geophysical data will help delineate and prioritize targets for the next phase of exploration. 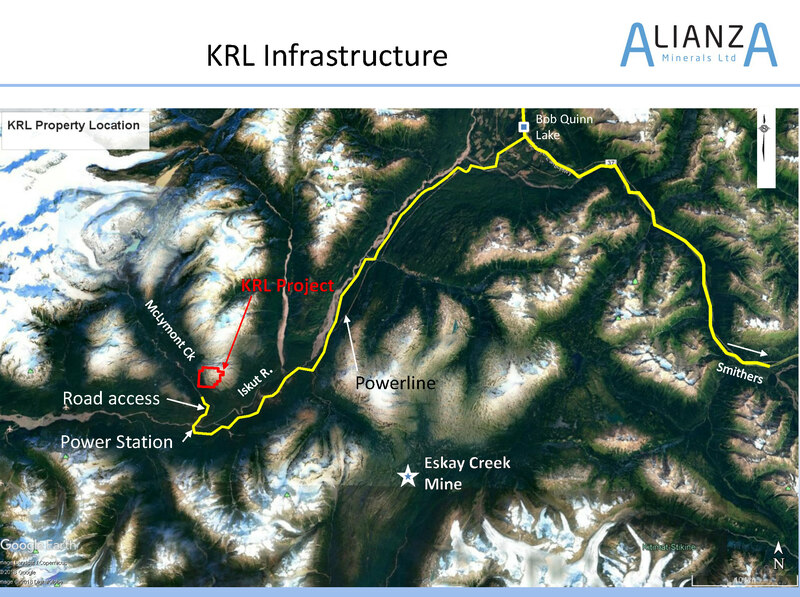 The KRL Property in under option from propector Bernie Kreft. 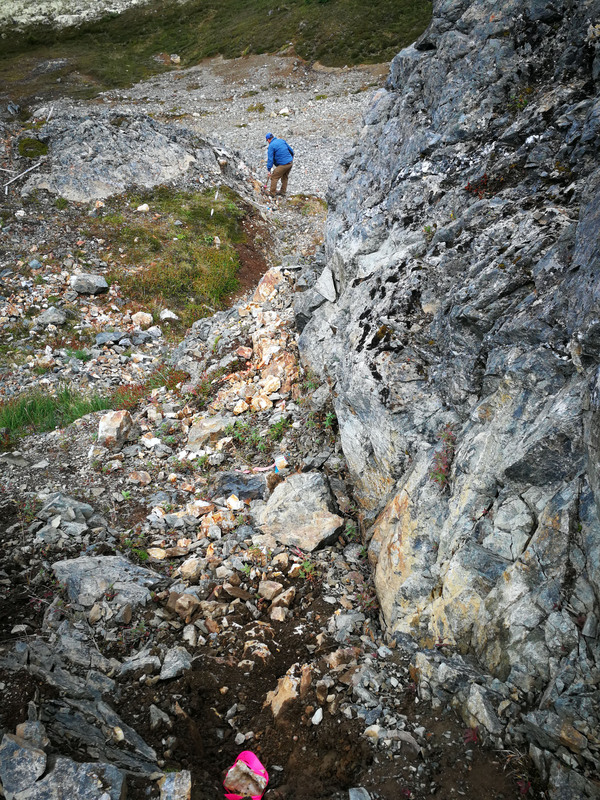 Mr. Kreft is a well-known prospector with properties in British Columbia and Yukon Territory. 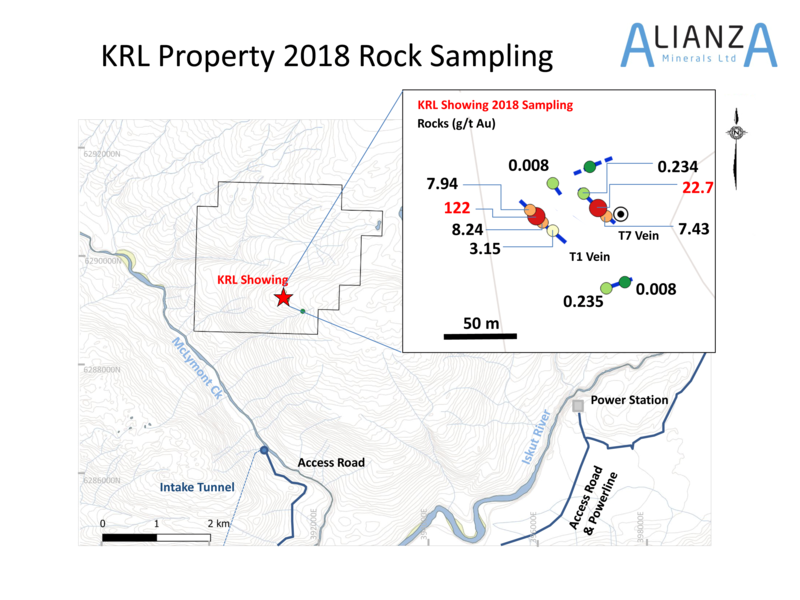 Alianza can earn a 100% interest in the property (subject to a 1% NSR) by conducting $2.25 million in exploration on the property over 5 years ($150,000 by Dec 31, 2019), issuing 800,000 shares of Alianza to Mr. Kreft staged over 5 years (100,000 on TSX-V approval), and by making staged cash payments totalling $250,000 over 4 years ($25,000 by October 15, 2018). Mr. Kreft is entitled to additional shares issued upon the disclosure of an NI43-101 inferred resource estimate equal to 1 share per ounce of inferred resource, to a maximum of 350,000 shares. An additional 500,000 share are to be issued on the commencement of commercial production.